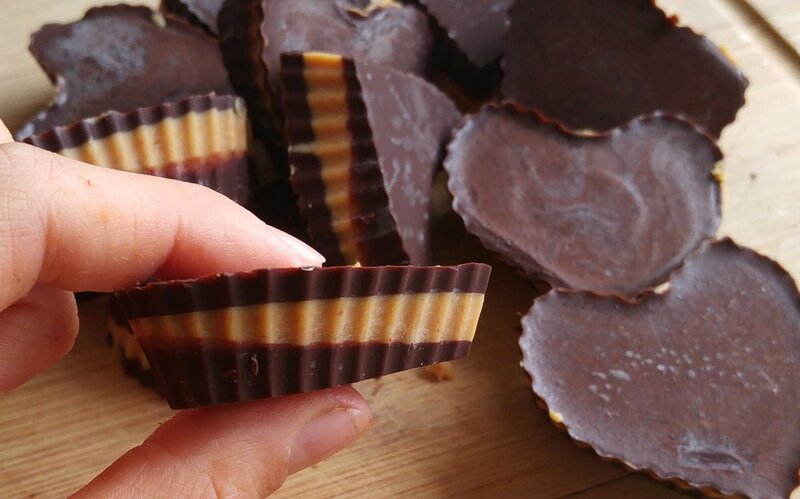 My recipe for clean PB cups is rich in beneficial magnesium, iron and antioxidants from cacao! Plus metabolism boosting, healthy fat burning MCT's from coconut oil! A healthy treat that is actually so rich and delicious! No refined sugar, low in natural sugar, and low glycemic (will not spike blood sugar). This recipe is also free of chemical preservatives and the many other questionable ingredients in the commercial packages of peanut butter cups. 1. For the chocolate layer - melt the coconut oil over low heat in a small sauce pan or pot, once it is in liquid form stir in cacao powder until smooth with a whisk, stir in your sweetener. Taste the chocolate at this point and add more sweetener if desired. Turn off your heat but keep the pot on the stove so the chocolate stays in liquid form. 2. To begin assembly - cover a cookie tray with muffin cups or chocolate molds. Pour chocolate sauce into your cups, no more than 1/3 full, place tray in the freezer to cool. 3. Prepare the peanut butter layer - begin by melting the coconut oil over low heat in a small sauce pan or pot. Once soft, stir in the peanut butter, sea salt and sweetener until well combined. Give your sauce a taste, again you could add more sweetener if desired. Turn off the heat but keep the pot on the stove to keep peanut butter in liquid form. 4. Check on the chocolate in the freezer - it should be firm by now or may need only another couple minutes, once it is firm take it out and top with all of the peanut butter sauce leaving enough room for a final chocolate layer at the next step. Place tray back in the freezer to firm up again. 5. Once the peanut butter layer has solidified this shouldn't be very long 10-12 minutes at the most in the freezer. Top up your PB cups with the remaining chocolate sauce, you may need to heat it again, do this only on very low heat and do not get it too hot! 6. Place your tempting tray of peanut butter cups back in the freezer one last time to set. 7. Clean up your kitchen while you wait patiently, your peanut butter cups should be ready in no time, roughly another 5 - 10 minutes, unless you made them really big, if you did good for you! 8. Once fully set you may enjoy your decadent chocolate creations, share them with loved ones. Be sure to hide from my chocoholic boyfriend because he will eat them all! *These Peanut Butter Cups should be stored in the freezer in a sealed container as they begin to melt at room temperature. When sealed properly they can keep up to a few months, if they last that long.